This is a 100% estate Napa Valley Cabernet Sauvignon from a family owned winery that produces about 2500 cases of wine a year. 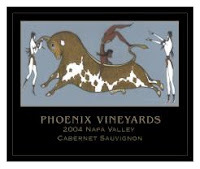 The whole 240 cases of this estate Cabernet was aged for 16 months in French oak and was bottled in 2006. On the nose I get big dark fruits of cassis, black currant, and blackberry. There is also a bit of tar, dirt, and peppercorn on the nose that add complexity to the fruit character. On the palate this wine shows flavors of blackberry, cassis, and cedar box. There is a serious amount of tannin that grips down on the tongue with significant force and causes this wine to finish extremely dry and slightly off balance. The fruit is there but the tannins are still so firm that it's hard to enjoy this wine without longer decanting or more bottle age. It's tough to tell if this wine would gracefully shed all that wood and show it's true fruit over time and thus I can only score this wine 89 points. A serious effort but I strongly recommend heavy decanting and a big chunk of steak!